Everything you need to master the skill of lock picking. 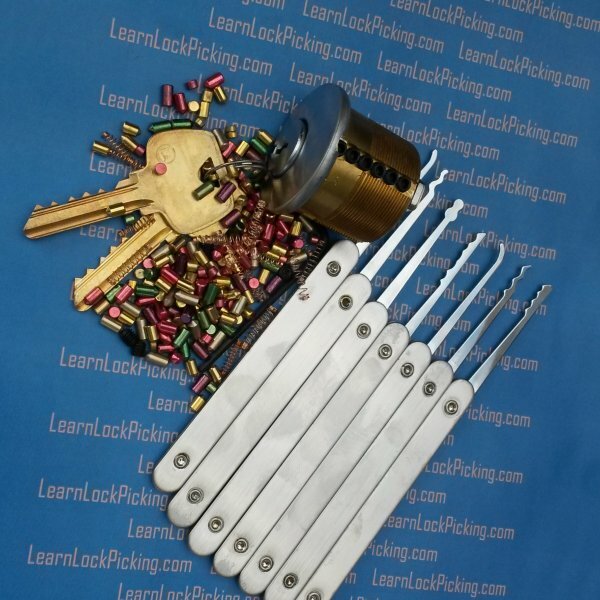 Includes our 6 pin Ultimate Challenge EZ-Rekey Practice Lock and our 8-Piece Premier Edition Chrome Plated Lock Pick Set at a savings over purchasing both items separately. SKU: 6 Pin Combo-Kit. Categories: Lock Picks, Practice Locks. Brands: LearnLockPicking. 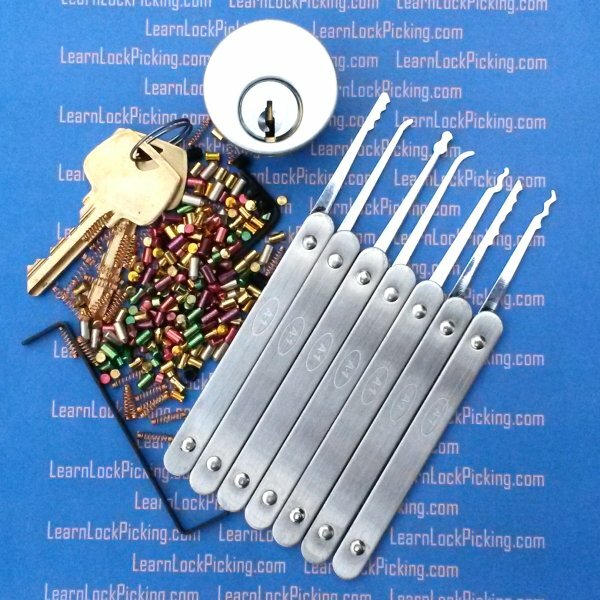 Our Six Pin All-In-One Lock Picking Training Kit includes everything you need to get started picking locks. Because this kit includes our Ultimate Challenge Lock, it will grow as your skill grow from a 2 pin lock for the beginner to a 6-pin locks, master-keyed lock, and even locks with spool type security pins. Thousands of challenges are possible with this one easy to re-key practice lock. The 6 pin Ultimate Challenge Practice Lock and our 8-Piece Chrome Plated Lock Pick Set are a great way to master the skill of lock picking. Get them both at this discounted price. My buddy finally convinced me to get this when I owned previous crappy Amazon cut-aways. It is an investment but I will say you can make it as hard or as easy as you’d like. I opted for the security pin bag too. I’m not nearly ready for those just yet. The lock is very good quality and pinning it is quite simple. I will also mention when using the master pins you do create multiple sheer lines which does make the lock much easier to pick. I would suggest not using them unless they are on the very top perhaps. Only thing missing is a pinning tray honestly. As far as the picks go they are of good quality. The only thing I don’t like about them is the blades are no all center. What I mean by that is on most of them the blade is on the bottom of the pick versus centered in the middle. You can clearly see it in the picture I just never noticed. I would say for any beginner you won’t find a better starting set of tools. I may even buy another for security pins only. Also note that the 6 pin lock and 7 pin lock have a different keyway. The 7 is a little harder. The training lock and pin set is a great starter lock 5* there! The A1 pick set isn’t great, wore the chrome off the deep hook my first night, but it does get the job done. First time picker. Mine just arrived today. Already have 4 pin stacks and am really feeling binding order. Enjoying this new adventure in lock sport. Just got my 6 ping challenge lock and set of picks. The lock is great and very versatile with the extra pin pack. The set of picks comes with an arrangement of good sturdy that are most recommended for people new to lock picking. There’s is only to small negatives that I have with the set. -The first being the picks themselves are bit uncomfortable to hold and will need a piece of tape warped around them. -Second I ordered the 6 ping lock and it arrived with only 5 pins in the bag with the key. This isn’t to bad as the kit came with a bag of what seems like a 100 different pins. I just received this set yesterday and am loving it. I removed all except the first pin set and started with 1 and am up to 3 now with semi-reliability. Looking forward to gathering up all my locks and giving them a go as well. Picks seem nice an study and love the larger handles. The lock is also nice and not a cheap lock to practice with. As a first time lock picker and, as such, first time buyer, I would say this was a good purchase. I heard about this product from a friend who had purchased this before me and he still has it on him at all times. I look forward to learning how to and getting better at picking. I gave it four stars because it is a great product. I enjoy the case for the picks as well as the ability to easily change the lock. However, as a fist time user I had nothing to go on except what I figured was right. I would have enjoyed some instructions or a list of sites to go to in order to understand and learn in that way. Great product!